Home / Blog • Featured / Weekend racing news! Goalspecific and Tripurbeck athletes have been out in force racing over the last few weekends, and have been producing some top results! First of all, at the Weymouth Half Marathon a couple of weeks ago, we had Ray (1:29) Eric (2:05) and son James (1:53) Adam (1.34) racing, all of which produced pbs in their first event of the season! Joined with Liz and Scarlett who I believe was running in her first Half event! Last week Terri faced some huge hills at the Lamar Running event, and despite a rocky road leading up to it, was not going to be defeated and put in a true performance! Finally this weekend just gone, we had Derek up first of all at Clumber Park European Qualifiers. Soon to be heading off in the 2016 European Champs in Soria, it was fantastic race practice and a great opportunity to qualify for 2017. He certainly didnt disappoint! It was a very close race. Less than a minute separated him from the lead age grouper, then he blew him away on the bike, but Derek was pipped to the post by 35 seconds. However, if we have a look at the transitions, it would seem Derek was 36 seconds slower in transition! ….mmmm. Need to sort that for Soria! Also racing was Laura, and Maria. Unfortunately the results are not posted yet, however, I do know that they both have got off to a fantastic start this season. Laura, after getting a hamstring and Achilles injury skiing only a few weeks ago, was brilliant at listening to Joe (Physio) and listened to her body with regards to returning to training, and somehow managed to get in a position to be able to race at the weekend. Although a bit rusty with transitions, and layering up due to the cold, she put in a great race, coming in 2nd overall, with Maria not far behind in 3rd. We also had some Tripurbeck Juniors racing, Harley Lexie, Iris and Lucy. Again, no results to see as yet, but I do know Lexie won the Tristarts and Harley came 3rd in his Age Group whilst nursing an injured ankle. 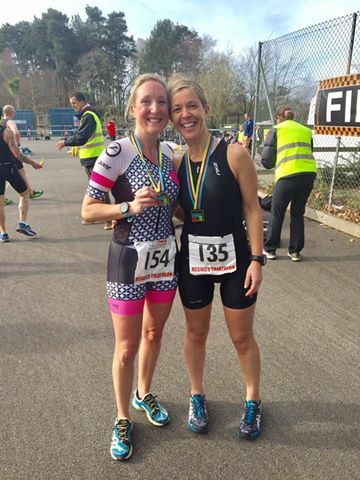 Finally we had Jenni Wisher, racing up North in a local Duathlon, and although, Jenni has felt that her winter training block hasnt gone as well as she would have liked, it would seem that the last few months have put Jenni in great shape for the season to come! Overall Female winner beating some good AG girls into 2nd and 3rd! Another brilliant start to the season. So, who is up next? Well, we have Nigel, racing his first duathlon……EVER….. after only starting training at Christmas, and I will also be testing out the new Team Carnac Planet X sponsors bike EXO3 in my first event in the best part of a year, after ankle surgery last July. It is time to test the ankle….sensibly! After getting back to running in January. its a long way from full strength, and fatigues quickly, but you have to start somewhere! Nervous??? …….very. After 2 years plus of struggling with a damaged ankle, going through surgery, and going through periods of not sure if I would be able to run again, now slowly coming out the other end, certainly creates lots of feelings! Certainly apprehensive, and I will not be going crazy, determined not to damage it, however, to now be in a position to put myself on a start line again is great, and hopefully it will be the first of many this year!